Some of the most widely used herbal remedies will be discussed below. Where does the herb grow? What is the history and origin of its use? What claimed and actually proven benefits are associated with its use? These and many other questions and interesting facts about herbal remedies hopefully will help you learn more about using herbs and the benefits they can bring to your health. Black Cohosh is a tall, flowering plant that flourishes in moist, shady conditions. It is a native of North America and grows freely in the woods of the United States and Canada. A black, cylindrical rhizome (root) with the remnants of many protruding branches forms into a ball-like shape underground. Harvested in the fall months, the rhizome is cut into pieces and dried. It is then further refined and processed for use. Also known as Black Snake Root, Rattle Root, Squaw Root and Bugbane, this herb is very widely used. Cimicifugin, an amorphous resin comprises about 18% of the root. It also contains several other resins, fat, wax starch, gum, sugar and an astringent. These “ingredients” give Black Cohosh a number of different helpful applications. The primary use for Black Cohosh is for the treatment of menstrual cramps and the symptoms of menopause. Women who suffer from cramps, hot flashes, night sweats, mood swings and sleep disturbances can benefit from Black Cohosh. More than 200 years ago, Native Americans discovered this plant had curative qualities for women with gynecological problems. Early on, it was thought that Black Cohosh reacted with a woman’s estrogen system to alleviate some of these symtoms. More recent research ties the herb’s efficacy to a favorable effect on the serotonin receptors. No matter what the reason, anecdotal evidence shows this product is helpful to many women. Over the years, new uses were found for this bountiful plant. Diarrhea, particularly when occuring in children, can be treated successfully with this herbal product. There is also an opposing view that because there has not been adequate studies and testing, Black Cohosh should not be given to children. Before giving your child this herbal supplement, it would be prudent to consult with your doctor or pediatrician. Black Cohosh has been used as a cough suppressant, to reduce pulse rate and to induce perspiration when trying to fight off a cold. It has been used as a salve and antidote for snake bites. Other uses for Black Cohosh include treatment of osteoporosis and rheumatoid arthritis. More studies still need to be done to determine the efficacy of the treatment on these specific conditions. Black Cohosh comes in a number of different forms. Freshly cut or dried Black Cohosh can be chopped up or ground up and used to make strong teas (infusions). It can be encapsulated and swallowed as a supplement. It can be used as a solid extract in pills or made in to a liquid extract (tincture). Side effects range from possible liver damage in very rare cases to weight gain. Low blood pressure, headaches, nausea, vomitting and indigestion have also been reported. Black Cohosh is a legal, well accepted herbal product that is available in health food stores, nutritional centers and pharmacies all around the country. Tea can be found in most supermarkets as well as many less traditional stores that cater to the alternative therapy and holistic healing markets. No prescription is required and Black Cohosh is usually located by the vitamins in most stores. Prices are very reasonable for most forms of Black Cohosh. CVS pharmacy sells a 100 pill bottle of 540 mg capsules for about $5.00. The name Chamomile is derived from the Greek “Kamai” (on the ground) and “melon” (apple). The Chamomile is a low growing herb that can be found in southern Europe and northern Asia. There are a number of varieties of Chamomile including both single and multiflowering versions. A grayish green stem with white petals surrounding the yellow center of the flower grows to a height of about two feet. The flower is harvested for medicinal purposes and the entire plant can be used to create an herb beer. The plant resembles the common daisy and grows best in sunny, wide open fields. There are literally one hundred or more claimed benefits to using Chamomile. Despite all the claimed benefits of Chamomile, scientists are still skeptical about how well this herb works. Without more scientific research, the scientific community will continue to question the effectiveness of Chamomile. That aside, many believers see this herb as highly useful with very limited risk. Nutrients, including certain bioflavonoids like Chrysin provide effective sleep inducing qualities. One of the chemical ingredients that helps make up the plant is coumarin. Heart patients often take a derivitive product (coumadin) to thin the blood and act as an anti-coagulent. Those with already “thin” blood should be careful not to use Chamomile as it can further thin your blood and create bleeding. Chamomile has been demonstrated as an effective herb for treating digestive diseases. Relief from indigestion and heartburn to Irritable Bowel Syndrome (IBS) and diarrhea has been treated with a fair degree of success. Anthelmintic agents present in Chamomile will destroy or expel intestinal worms. The pain relieving and sedative qualities of Anodyne make this herb a great calming and sleep agent. A cup of Chamomile tea at night is often the cure for insomnia. Others have used Chamomile to fight off the debilitating effects of a nasty cold. Chamomile also can be used externally. A solution can be made to treat skin conditions like eczema. Soaking in a bath with Chamomile can reduce swelling and relax the muscles. It has been shown to be more gentle than some traditional medicines and is used in patients that can not tolerate caffeine. Those sufffering from peptic ulcers, high blood pressure and heart disease have been able to use Chamomile to relieve symptoms without any serious side effects. Muscle spasms caused by alkaloids are a rare, but possible side effect. Individuals allergic to ragweed pollen should not use Chamomile as it can cause severe shock. Taken in moderation, this herb is generally safe. Too much can cause vomitting. Skin contact may lead to skin rashes. It has even been claimed to have hypnotic powers. Because there have been very few long term studies and scientific evidence is not complete, Chamomile should be taken in moderation. 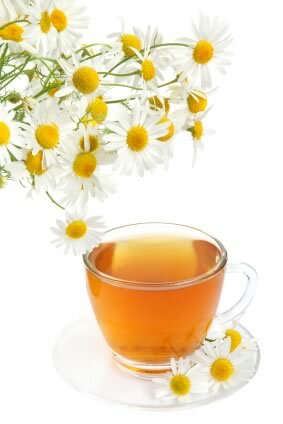 As always, if you are taking other drugs, check with your doctor before using Chamomile as a regular health regimen. Some rather famous celebrities have been espousing the virtues of Chamomile tea. Singer/Songwriter Alanis Morrissette calls Chamomile tea her favorite drink. Actress Jennifer Alba helps to keep her good looks by using Chamomile tea bags to reduce the puffiness in her eyes. You don’t have to be a celebrity to use Chamomile tea. Everyone can try it. 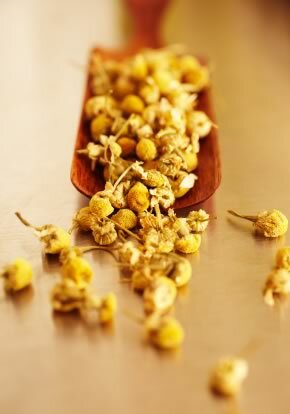 Chamomile is available as a tea, in capsules and in liquid form. It is widely available in all traditional outlets that sell teas and health related products. Grocery stores, Nutritional Centers and Pharmacies all sell some version of Chamomile. These days, like almost everything else, you can also buy Chamomile online. Infusions of honey, citrus or any number of natural flavors makes the taste of Chamomile tea pleasing to the palate. Prices are in line with other premium herbal teas and a twenty cup supply will cost under $10.00. A monthly supply of Chamomile liquid extract or capsules is also well below $10.00.Herbal remedies to treat and cure ailments of every type have been around for thousands of years. Aloe Vera is known to relieve burns. Milk Thistle promotes liver health. Echinacea can help with respiratory infections. These are just a few examples of how commonly grown plants (herbs) can be beneficial to the health of people all around the world. There are hundreds, if not thousands of herbs that have been shown to have healing and curative properties. An alphabetical list of many well known herbs is shown below.